King Abdullah of Saudi Arabia doesn't usually travel light. An official visit from the 86-year-old monarch typically involves an entourage large enough to fill at least five jet airliners and includes a mobile medical clinic, a handful of his four wives and 22 children, and an ample selection of senior royal advisers and cabinet ministers. But the fact that the King showed up with just one plane in Damascus on Wednesday didn't seem to faze a beaming Syrian President Bashar Assad, who was waiting at the airport with a red-carpet welcome. Abdullah's visit is a particularly sweet foreign policy triumph for Assad, who became persona non grata after many in the international community accused Syria of involvement in the 2005 car-bomb assassination of former Lebanese Prime Minister Rafik Hariri in Beirut. In the past year, however, the Syrian leader has hosted a growing number of heads of state and world leaders, including French President Nicolas Sarkozy and U.S. Middle East envoy George Mitchell, who have sought Syria's cooperation in settling many of the region's seemingly intractable disputes. In particular, Syria and Saudi Arabia have long been on opposite sides of a deep rift in the Arab world, pitting those countries that are allied with the U.S.  including Saudi Arabia, Jordan and Egypt  against those countries and militant groups such as Syria, Hamas and Hizballah, which have opposed American power in the region and are at war with Israel. That rivalry deepened after the assassination of Hariri, who was Riyadh's main ally in Beirut, and got personal during the 2006 war in Lebanon, when Assad implied that the King and other Arab leaders who had criticized the Hizballah raid on Israel that sparked the conflict were "half-men." 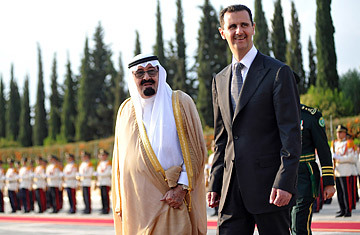 Saudi Arabia withdrew its ambassador to Syria in 2008, and last year King Abdullah boycotted the Arab League Summit in Damascus. But several factors have been pushing the two countries back together. Though Syria survived the efforts of the Bush Administration and Saudi Arabia to isolate the country politically, it faces huge economic challenges as it switches from a Soviet-style economy to a market-driven model. Syria has been touting itself to investors as a future regional industrial and transportation hub. But it will need plenty of Saudi money and Western know-how  not to mention improved diplomatic relations  in order to make that great economic leap forward. So Syria has been slowly accommodating American and Saudi positions on several issues as well as opening an embassy in Beirut, gracefully accepting the electoral defeat of its Lebanese allies in June, and restricting the flow of foreign fighters across Syrian land into Iraq. For their part, Saudi Arabia's leaders have grown increasingly worried about the rising power of Iran. The Persian and Shi'ite dominated Islamic Republic is both a religious and racial challenge to Arab and Sunni Saudi Arabia's dominance of the region, and Iran has deftly exploited the divisions in the Arab world by allying itself with radical anti-Israeli movements, in concert with Syria. With Iran's ongoing nuclear-development program  which many Arab countries suspect is a cover for producing weapons  raising those concerns to a fever pitch, Saudi Arabia has decided it can no longer afford open confrontation with Syria. But wooing Syria away from Iran will be no easy matter. Syrian officials have long said they would be open to a regional peace if Israel returned occupied Syrian land in the Golan Heights and offered a just settlement to the Palestinian question. But they have also maintained their right to continue Syria's relationship with Iran and support for Hamas and Hizballah, just as the U.S. arms and supports Israel. Indeed, rather than distance themselves from Iran, the Syrians recently gave the greenlight for Iran to expand its embassy in Damascus, already Iran's largest in the region. And the close ties between Iran and Syria were visible last month at a Quds Day celebration at the Yarmouk Palestinian refugee camp in Damascus in September. The holiday has its origins in the aftermath of the Islamic revolution in Iran, when Ayatullah Ruhollah Khomeini declared the last Friday of the Islamic holy month of Ramadan to be a day to protest the Israeli occupation of Jerusalem. The keynote speaker at the celebration in Damascus was the personal representative of Iran's Supreme Leader, Ayatullah Ali Khamenei, who thanked Assad for his support of the Palestinian cause and condemned those who would split apart Muslim "crescent of resistance" to Israel. "Let the good relations between Iran and Syria be an example for all Muslims to do the same," said Moujtaba al-Husseni, an Iranian cleric. Still, in the short term, Abdullah's visit is at least a sign that the leaders of the Arab Middle East have backed away from a regional confrontation. However, with Israel threatening to shut down Iran's nuclear program the old-fashioned way  by military strikes  if an alliance of Western nations can't do so through negotiations, it's unlikely that peace will hold for long.